“We have a new project at the Buddhist Centre - "Karuna". I am happy to report that it is growing up even more and more. We are running activities to help groups of disadvantaged people - children without parents, children that live in the street, old people, people with troubled psychology, etc. “Since 2007 we have been organising collections of different goods. After we make an appeal, people bring and leave things in the Buddhist Centre; and we find that after some months of collecting we have enough to leave them to institutions that help people. So far we’ve done 4 appeals, all with good results - the most recent have been toys in April and food in December. With these we have helped 22 different institutions and more than 1500 people. “We are very excited, we have finished our collections for the year 2009 and we are glad. With these activities we’ve been able to help people who come to the Buddhist Centre to practice compassion and kindness, (Karuna, Metta) - and of course the donations have had benefits in their own right. “It could be the response of Mexicans to the work of TBMSG and the Karuna Trust in India. “We think that when we engage an activity like this we can help change the attitude of people, the tendency towards discrimination against people on another economic level, or old people, or with some incapacity or another - we can help to break the barriers that exist between Mexicans. 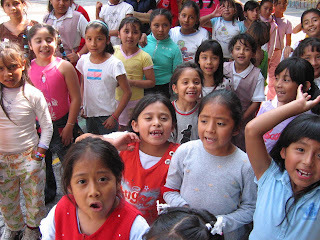 “Our web page in Spanish is www.karuna.mx.